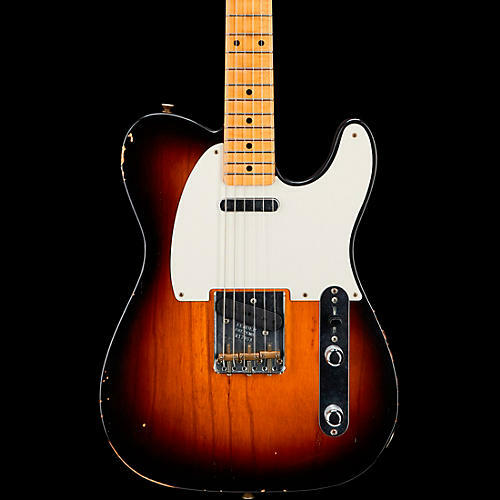 The Fender Custom Shop Vintage Collector Series 1955 Relic Telecaster Masterbuilt by Yuriy Shishkov will please any vintage Tele fan fortunate enough to strap it on. This Guitar Center exclusive is part of our Vintage Collector's series. These will be limited to only 15 instruments worldwide and found only at Guitar Center. These are recreations of Joe Bonamassa's 1955 Telecaster in 2-tone sunburst, which was an exceptionally rare color in 1955 on a Tele. His guitar was purchased from our Vintage department and is such a special guitar that we had the Fender Custom Shop make 15 recreations of it built by Masterbuilder Yuriy Shishkov. The Vintage Collectors series is based on ultra cool guitars that were purchased from our Vintage department at Guitar Center. Close inspection reveals the remarkable workmanship and relic treatment that Yuriy of Fender Custom Shop is known for. It has an ash body with a quartersawn maple neck sporting a '57 soft "V" back shape. The fingerboard is maple with 21 vintage frets and a 7.25" radius. Chrome hardware, a vintage bridge, a single-ply parchment pickguard and two hand-wound pickups come together to produce a fantastic look and classic Tele tone. Includes case and a special COA signed by Joe Bonamassa.